I love kuih makmur. Melty and buttery on the outside, sugary peanutty on the inside! Heaven! I was introduced to this cookie by my ex colleague Hashita. Once bitten, never shy! I was crazily in love with it and was searching around for one that will match Hashita's mom's. Sadly, none! Most tasted rather firm, rather than melt in the mouth. Even though the bought cookies used ghee as well, but it's not really that melty, compared to the ones Hashita gave me. When I first made these 10 years ago, I toasted the flour, even when nobody told me so. I don't remember why I did that, but I think it's because of an advice I heard from an old friend that sunning the flour makes cakes lighter, and so I chose the toast instead of sunning, LOL. It's much quicker! But then recent years after reading blogs, I do read some recipes calling for the flour 'disangai', that means to be toasted. ah-ha, so that step of mine was actually correct! And why is mine... homogenous? Where's the filling? During my first attempt, it was so hard to form...that I got so frustrated I threw everything in and rolled into balls. To my surprise, the taste was still good, just that there won't be a burst of sugary nuts when you bite into it. But it saves a lot a lot of time! 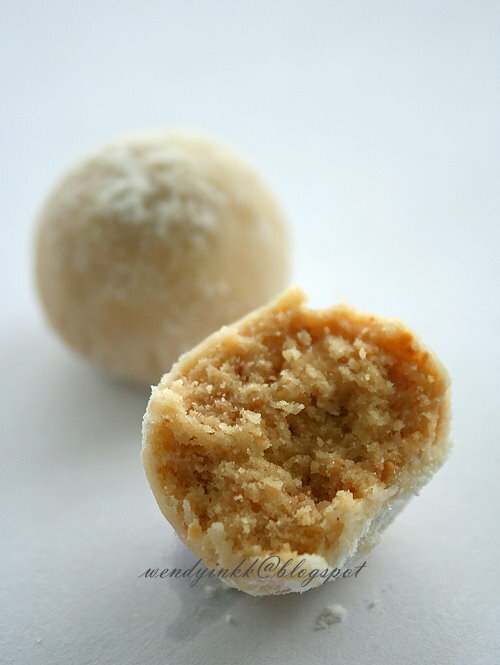 Actually kuih makmur should have a sugary peanut center. And it was me being lazy, yes, me bad. And so, if you are feeling diligent, wrap each cookie, but if you want to do things quick, try this easy version. 1. Spread flour onto baking tray and bake in a preheated oven for 5 minutes at 160(fan)/180C. Let the flour cool down. 2. Mix peanuts with 2 Tbsp of the toasted cake flour. Grind until fine. (not too fine like powder). Mix with the rest of the cake flour. 3. Mix ghee with sugar. Then add in egg, mix until well combined. 4. Pour half the flour mixture into the ghee mixture. Mix until well combined. Pour the rest of the flour mixture and mix to form a dough. 5. Take some dough (about ½ Tbsp level) and roll them round. Place on a lined baking tray. Roll all the dough into little balls of similar size. 6. Preheat oven to 160(fan)/180C. Bake each tray for 15 minutes. 7. 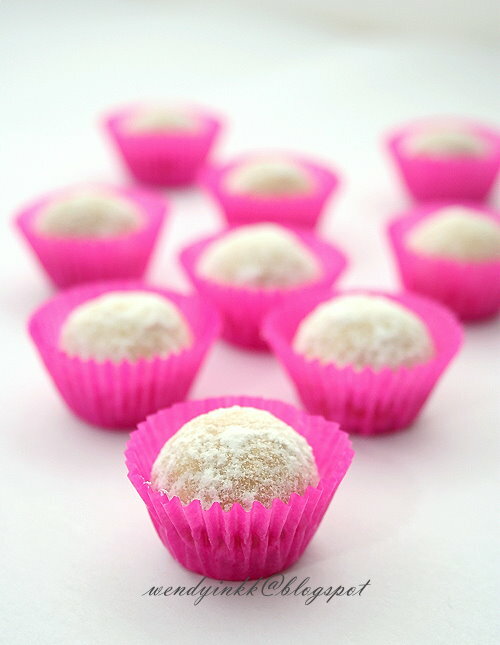 Roll the warm balls in icing sugar and place them into mini paper cups for easy handling. This cookie goes well the our CNY ... Anything in the name of Wealth, Success... is good ! This cookie tasted close to heaven too . Hi, I love makmur cookies too and yes, they're tedious to make. This sounds simple and I'd love to try. However, can I substitute ghee with butter, and if yes, how much? Thanks! Oh it is easy to make! Yes, and being prosperous is perfect for Chinese New Year, hehehe. Masuk mulut sama saja, hahaha! May I know the reason why you want to substitute? Ghee is pure butterfat whereas butter is only 80% butterfat and the moisture in butter will not give you the same melt in the mouth texture. Hi Wendy. thanks for sharing the recipe...may God bless you. hi Wendy. Do I have to melt the ghee? No need, just use it as it is. If you are from a tropical country, it is already very very soft at room temperature.